William Hill has been providing gambling products to its customers since 1934, and from those humble beginnings it has gone on to become one of the best known brands in the industry. They now employ over 16,000 people, operate over 2300 betting shops, and host players online in over 180 countries. It hasn’t all be plain sailing however, and the company has come under fire several times in the past; most recently being fined 6.2 million (ouch) by the Gambling Commission for accepting large sums of money linked to illegal activities. It can’t be denied, though, that William Hill offer their players a truly superior online product, with mobile and download versions available as well. The website retains a traditional feel while at the same time providing a contemporary online gaming experience, with Slots, Table Games, Live Dealers, Jackpots and more all available, and it couldn’t be easier to find what you want. The layout is clean, there are no obnoxious flashy adverts, and all in all it’s a pleasant and unintimidating interface. This is good news for new comers in particular. 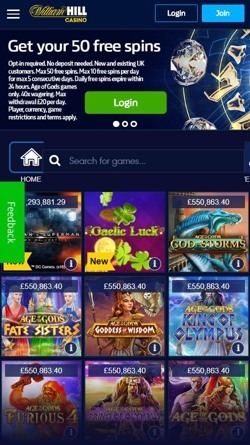 The main Casino software is powered by Playtech, so you know you are in good hands with a site that won’t let you down and Jackpots that regularly smash the one million pound barrier. First things first, William Hill has actually split the casino elements into various different sections such as Vegas, Live Casino, Games, Macau etc. Confusingly, there is also a main Casino tab which takes you to a dedicated Casino page that has an overall different look and layout. This is potentially irritating as you might have to navigate between them to find what you want, but we can see why they have done it. Everything under the Casino tab is powered by Playtech, including the site itself, and since they are the bookies main provider it makes sense to host all of their games in one place. Aside from this minor inconvenience the range of games seems endless and there are loads of other software providers, with Microgaming, NetEnt and Cryptologic all making an appearance, plus multiple smaller providers and a few of William Hill’s own products as well. Enough to keep you busy for weeks on end. There are around 30 live games available in total, covering Roulette, Blackjack, Poker and Baccarat, with some interesting variations thrown in too. Games under the Live Casino tab are powered by Evolution Gaming, another industry giant, and here you can choose games listed under the Mayfair, Vegas or Macau categories to give a different atmosphere depending on how you are feeling on the day. Slots – Explore 800+ slots from more than 20 developers. There is a massive amount of choice here from series’ such as Age of the Gods to quirky adaptions like American Dad. Jackpots – With more than 130 jackpots there is something for players at all levels. Some, such as Beach Life, are currently pushing towards the two million mark. Live – As we mentioned there are around 30 live games on offer. There’s VIP Blackjack if you’re feeling flush, French Roulette if you’re feeling continental and Live Texas Hold’em if you’re feeling… like a cowboy. Roulette – 7 variations of Roulette await you with varying table limits. If you want high stakes go for Gold Salle Privee; if like to be a bit more cautious have a look at Mayfair Roulette. Blackjack – Ever popular, there are 15 Blackjack games at William Hill, and everything is covered on these exclusive tables. VIP, Genie Jackpots, Pig Wizard, Unlimited, you name it. Table – If table games are your thing then you have at least 45 to choose from. Themed Hi-Lo games like Around the World and classic dice games like Craps will keep you entertained for hours. Tournaments – Frankly, there are loads. Every day scores of games of Hold’em, Omaha, and Omaha Hi-Lo are on offer, with buy in’s starting at 50p allowing players at all levels to join in. The look of the Casino site is pretty simple without being boring, incorporating its own categories that you can use to narrow down your search. These are well thought out and the additional search bar makes it even easier to find what you are looking for. There is an option to download the casino (powered by Playtech) and they also make it easy to see the rules of each individual game. User friendly indeed, and if you are a new player then something you will no doubt be thankful for as you find your feet. You can download one of the various William Hill apps (and they have one for everything) if you only play specific games, or you can open the site through your device’s browser and access everything. Both options are quick and simple, so if you know how to use your device you will be able to figure it out. Once open, you will find it looks much the same as it does on a desktop, although it is slightly less responsive and a little slower to load, but it looks great graphically and works fluidly once everything has initially loaded up. There might be a few games missing on the mobile site, but you will still have access to 650+ which is more than some desktop sites can offer. Like the main site, these are from a mixture of providers with Playtech making up the lion’s share. The Casino app specifically deals with Playtech products only. There is a separate app for the Live Casino but all of Evolutions offerings are in there, whereas there are one or two of Playtech’s live games missing from the Casino app. The various apps all connect to the mobile site as well which is pretty nifty, so if you are in the Casino app and decide you want to play a slot from a different provider for example, you can select it from the menu and the app will send you to the respective area of the mobile site via your browser. The company was founded in 1934 by a Brummie called, you guessed it, William Hill, and interestingly, gambling was still illegal in the UK at the time. It’s not unfair to say that this rocky relationship with authority has been a reoccurring theme in the company’s history, with various fines and scandals coming up over the years. Despite this, William Hill remains a trusted favourite of millions of gamblers around the world, and it can’t be said that they don’t look after their own – one-time Saturday boy Ralph Topping became Chief Exec in 2008 after 35 years working for the company at all levels and climbing the ladder. The website launched in 1998 but by 2008 it was recognised that they needed help with their online operations, and so the partnership with Playtech was formed. They are now back on track and can boast being the UK’s largest operator, accounting for 25% of the market in the UK and Ireland. Not too shabby for a kid from Birmingham. 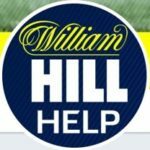 A quick search online shows a fair few complaints about William Hill’s customer support, although these should always be taken with a pinch of salt. You can get in touch with them via e-mail, phone, post or live chat which is available 24/7. If you have a question, though, it might be just as quick to have a look in the Help section or FAQ’s as they are pretty exhaustive. There are various ways to access all of this info but in general if you look at the very bottom of the Casino page and explore the Contact Us or Help links you will find what you need. If you can’t find a way to contact William Hill than chances are the problem isn’t them. They even have a dedicated Twitter account. If you need help, one of these methods should suit you. Live Chat – This can be found by scrolling to the bottom of the page and clicking the speech bubble icon.